Grace VanderWaal is a singer-songwriter from Suffern, New York and she was born January 1, 2004. She entered the America’s Got Talent 2016 competition and performed her original songs, “I Don’t Know My Name” and “Light The Sky”. Grace blew away the judges, Howie Mandel and Simon Cowell with her amazing voice and skill at playing the ukulele. Simon Cowell declared that she will be “next Taylor Swift”. She was only twelve years old. She lives with her parents, an older brother and a sister. She is 12 years old in 2016, small child. Original songs – The Good Just Gets Better, I Don’t Know My Name, Beautiful Thing and Light The Sky. 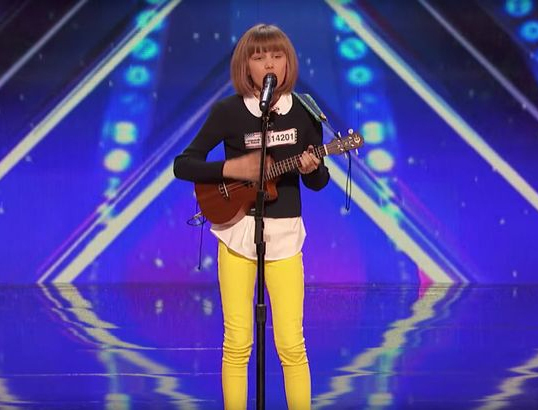 Grace VanderWaal: This 12-Year-Old Ukulele Player Gets Golden Buzzer and now is ready to set the world on fire with her beautiful voice. She likes to read, watch TV and snuggle with her dog. She like make-up and ding girly things. 1. Grace is certainly a pigment of the new generation who create original content. She writes her own songs and plays the ukulele. All creativity coming from the depth of her soul and mind. She is so young with so much talent and that is why she is loved my so many people across the world on social media. 2. Mandel’s “Golden Buzzer” landed her in the audition round of America’s Got Talent, which open the door for all to see what she is really made of. She has not disappointed her fans, who is growing day by day. 3. Grace showed up again in the live show with an original song, “Beautiful Thing”, which moved Simon so much so that he predicted that she will be a force to be recon with in the future. 4. Listening to her interviews it’s amazing how mature she is at the age of twelve. She is very smart and has an old soul. 5 She won America’s Got Talent and received flowers from Taylor Swift. She was also congratulated by Reese Witherspoon, Jason Mraz and Ellen DeGeneres on Twitter.